The last few weeks of 2011 saw an astonishing number of public crisis arise at corporate giants, colleges and universities, and even well respected brands. When they needed a plan the most, many of these organizations failed and severely bruised their reputation, faced public humiliation, and sometimes even suffered sales. The truth is that is not about whether or not a crisis will arise, but when one does the plan of action that should follow to appropriately and strategically handle the crisis so that it does as little damage as possible to the organization. As simple as it may seem, organizations fail during a time of crisis because they lack a pre-established crisis communications plan that they can rely on. During a crisis is never the time to figure out what to do; it’s too late and you’re in repair and recover mode by now. While an organization can never be fully prepared for the oncoming damage, there are a few tactics to put in place before disaster strikes. Always be ready. You can never predict when a crisis will hit, and when (not if) it does, regardless of the severity of the crisis, your organization must be ready with a well thought out course of action. There must be an internal and external communications strategy and a chain of command already established pre-crisis. Seek outside counsel. Although most organizations have an internal communications team, you should not rely on staff managing all of the communications efforts during a time of crisis. Before a crisis even arises, establish an ‘as needed’ agreement with a crisis communications firm preferably with proven experience managing crisis for similar organizations. Mobilize spokespersons…immediately. A good crisis plan always has spokespersons identified well before the crisis hits. Spokespersons should serve as a good representation of the organization and be adequately trained to appropriately address the media and the public under the counsel of an attorney. Take accountability. Provide an immediate apology, and never shift the blame. Sounds simple but it never fails out company executives and spokespersons think they’re helping by minimizing the situation. Don’t hide…transparency is monumental. Now is not the time to avoid the public. The crisis is usually the result by an error in judgement by the organization. So it goes without saying that transparency is key. Don’t avoid the media…they will find you one way or another. In addition to transparency, you have to address the media. However, you manage them; they don’t manage you. Before an interview, always request the interview questions or topics to be discussed so that spokespersons are adequately prepared. “No comment” is the worst thing to say. Nothing pisses the media off more than these two simple words. You always have a comment and if you decide not to share your comment…guess what, the media will assume all types of comments on your behalf. Remember, you control the media; don’t let them control you. Anticipate tough questions. As part ‘B’ to the above, avoid uncomfortable situations where you respond with “no comment” by anticipating tough questions. Nothing makes life easier than to be prepared, and reporters will gladly provide with interview questions prior to the interview…and if they won’t, you have the right to refuse the interview. Connect with the audience. Prepared statements are ok to use, but they risk coming across as too scripted and not genuine enough. Spokespersons should not be so stoic that they lose the personal touch. Relate. Show genuine empathy, concern, and compassion for victims, injured parties, damages, and any inconveniences. Identify key messages…but avoid self serving messages and communications. Always monitor media and what’s being said. Your brand is everything and if left at the hands of media and the court of public opinion, your brand can be shred into pieces in no time. Attorneys are important but they know nothing about communications. Know that everything said can be held against you in a court of law. So work under the counsel of an attorney, but also know that they’re job is to defend you, not represent you in the media. While they know how to keep further damage from being done, attorneys are not trained in communications. In fact, attorneys should work cooperatively with the internal communications team and crisis communications firm. Always tell the truth. Whatever you do, never ever ever lie or conceal the truth. The truth always comes out. Nothing deteriorates credibility than to admit fault when you’re wrong. Publicly take accountability. Customers will respect you for it. Avoid defensive and argumentative language. Pretty straightforward here. Fix the problem. Many organizations are so blinded by the crisis itself that they never use it as an opportunity to actually fix the problem that led to the crisis. Take this as an important for business improvement. 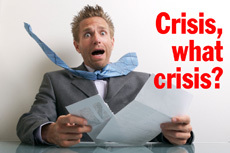 Crisis only helps to make an organization stronger and better prepared. Tell your story. A crisis communications plan should never stand alone and should be a part of the overall PR strategy. In the midst of mitigating the crisis, also be sure to tell your organization’s story but err on the side of appearing defensive or out of touch. Humanize your brand with real life stories that are relevant. It’s business as usual. Never abandon the reason why you’re in business. Regardless of how bad the crisis may be, over serve your customers during this time. Use the crisis as an opportunity to redefine and recommit to your business mission and create more value for your public. Ride out the storm. Sometimes an organization ends up doing more harm than good simply because they’re too on edge. This is usually the result of an absent crisis communications plan. Preparation is key and it shows in your handling of the crisis. Remain ethical. In the end, the public will respect the organization for remaining ethical during the crisis. Always remember that it’s absolutely possible to bounce back after a crisis, but an effective plan will determine how quickly and how much stronger the organization is once it bounces back.